Rural villages such as ours rely heavily on the support of their local inhabitants. Your subscriptions will help us to meet our stated aims and maintain Hever as a village we can all feel proud to live in. Members receive copies of our ad hoc newsletters which contain information about local events and general information. More urgent matters are communicated on an ad-hoc basis by news flashes emailed to members. Please HRA’s email address hra@hever.org into your email contacts to ensure that our emails are not sent to your spam/junk folder. Residents of Hever are eligible for full membership of HRA. We also welcome affiliate members from outside the parish. Membership does not impose or imply any form of commitment other than payment of subscriptions, and members are free to withdraw at any time. Annual membership is £15 for a family and £10 for an individual (£1 for fixed income). Subscriptions are due on 1 January each year. New members may wish make a one-off payment by bank transfer and then set up a regular annual standing order to leave their account on 1st January of the following year. Please include the reference ‘HRA Subs (your last name)’. 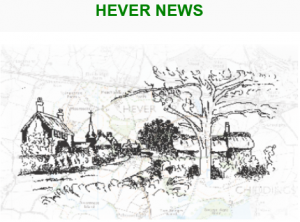 If you prefer to pay by cheque, please make cheques payable to “Hever Residents Association” and post to the Treasurer at Brocas Cottage, Brocas Road TN8 7LE. Please note that if you have set up a standing order and wish to leave the Association in the future, you will need to cancel your standing order with your bank when you leave. HRA respects the privacy of its members, please see the link for further information about our Data Protection Policy.